Dani McVety, DVM, and Mary Gardner, DVM, founded Lap of Love Veterinary Hospice—a network of veterinarians dedicated solely to end-of-life veterinary care—in 2009. Their unique practice has grown steadily over the years to become the largest practice of its kind in the country, comprising more than 90 veterinarians around the United States. American VeterinarianTM caught up with these pioneering veterinarians at the 2017 Western Veterinary Conference in Las Vegas, Nevada to talk about palliative care, hospice care, and euthanasia. Our candid conversation revealed why these doctors do what they do and how they do it with grace and an unwavering commitment to empowering veterinarians to provide the highest standards of care and support for patients and pet owners. Here is the first part of our conversation. Do most veterinarians understand the benefits of palliative and hospice care? 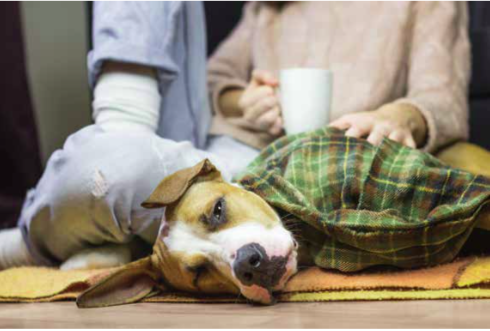 Mary Gardner, DVM: Veterinary hospice and palliative care offer a number of benefits, but there are misconceptions throughout the profession about this type of care. Many veterinarians think we’re prolonging suffering or avoiding the inevitable or trying to take money from families during their darkest time, but that’s not what it is at all. So, how do you define it? MG: Veterinary hospice is about supporting families during a very difficult time by helping them decide when to say goodbye, letting them know what to expect when they do and, most importantly, supporting that pet medically and making sure he is as pain-free and anxiety-free as possible while still having a good life. It’s not about extending life; it’s about increasing the pet’s quality of life for the time he has left. Studies in human hospice have shown that when people start the hospice process sooner, they actually increase their time with their families. I don’t think terminally ill and very advanced geriatric-stage pets are being seen enough in the veterinary clinic. If we start talking about hospice sooner or the things we can do to help manage these geriatric pets, we’re going to have much better success supporting that pet and that family toward the end. That way, when the time does come, the client is going to be well educated and well prepared. Dani McVety, DVM: Our profession has been doing hospice care for generations—we just haven’t called it that. When you use the word “hospice” with a family, they immediately switch their thinking to, “Oh gosh, thank goodness my vet isn’t going to try to talk me into treatment or radiographs or anything!” They immediately know that you’re going to support the human–animal bond for as long as possible. Sometimes that means waiting a few days until the spouse returns from out of town or the kids can come back from college to be with them for Christmas. So hospice care continues to be about the human–animal bond? MG: Absolutely. We’ve found that using the word “hospice” really helps. Whatever an individual family’s circumstances, hospice care gives them a little bit more time to wade through the decision-making process. It also solidifies the bond between the pet and her family because now the family is not really worried about what’s going to happen—the end is kind of already known—and they’re more comfortable talking with their veterinarian about what is going to happen because they don’t feel like they’re going to be pushed into more treatment. So instead of hospice care being something we add on, it’s something that ends up providing a paved pathway, if the family chooses, to euthanasia. Let's talk about convenience euthanasia. What is it, and how do you feel about it? DM: Convenience euthanasia is a very hot topic in veterinary medicine. I don’t think I’m alone when I say that I was the freshman student in veterinary school saying I will never euthanize a healthy animal. We always say they’re adoptable, they’re treatable, they’re healthy. But “adoptable” is very subjective. In the veterinary profession, we’re the ones who have the 1-eyed cats, the 3-legged dogs, and the other animals that in some way maybe the general population didn’t find adoptable. “Treatable” is also very subjective. We don’t know what people are going through. We talk about people having 4 budgets: the financial budget—whether they can afford to pay for treatment; the emotional budget—whether they can deal emotionally with the treatment that’s going on; the physical budget—whether they can physically nurse the pet through recovery from a difficult surgery or other at-home treatment tasks; and the time budget—whether they have the time to give their pet an injection twice a day or bring her to the emergency room. MG: Or let her out every 4 hours when she’s incontinent. DM: Exactly. So all of these words are very subjective in our profession. But many of us tend to focus them into one thing, meaning that if this pet is treatable, adoptable, anything, then euthanizing that pet would be wrong. What options should be explored in these cases? DM: Any nonmedical request for euthanasia, even if we don’t agree with it, means the human–animal bond is broken. Instead of looking at a request for euthanasia as “wrong,” I would rather us consider the other options for that pet because what are the alternatives? It might mean the pet is going to be let out of the carrier into a parking lot (which I’ve seen happen) or dropped off on the side of the road or put up for sale on Craigslist. A lot of things can happen if we say no. We need above all to help—maybe it’s euthanasia, maybe it’s adopting the pet through our services, maybe it’s working with a rescue. I don’t know what it is, but what it is not is judging. Judging a family for what they’re going through when we don’t necessarily understand their situation is the one thing, in my opinion, that is going to harm our profession long-term. How about simply saying, “You know, I understand your pet doesn’t match your decor in your house anymore, so why don’t you let me take him?” Because if there’s somebody who says that to me, that’s my true definition of convenience euthanasia. MG: Right, or “I’m moving to an apartment and I can’t take my pet.” But when you have a dog or a cat that’s urinating around the house, I call that inconvenience euthanasia because my husband would not like that and I wouldn’t like that. And sometimes it’s easy for us in the veterinary profession to handle urine, blood, vomit, and diarrhea, but it’s not as easy for the public to do. And about 3% of people still think pets are property. I’m not saying that’s right either, but if I don’t agree with it I will take that pet and find it a new home—but hopefully not in my house because I’ve got enough! DM: The point is that we need to think about the alternative for these pets, and instead of sitting on a moral high horse and saying no, how about we say what can we do because the current situation isn’t sustainable? What about a pet that is terminally ill? MG: I don’t need active suffering to be present for me to feel OK about the decision because when we took our oath we promised not only to stop suffering but also to prevent it from ever occurring. So, if a terminally ill pet is just diagnosed, I’m comfortable saying goodbye then. There are some veterinarians who would say that’s convenience euthanasia because the pet is not suffering yet, but I’m OK there. You talk about the “emotional quotient” of veterinarians who work in end-of-life care. What do you mean by that? And it’s so funny how we have to qualify that, right? We’re the only medical profession licensed to perform euthanasia. We should be the best, we should be proud of being the best, and we should be proud of the fulfilment that we get. Everyone says, “I get so many thank you cards for that euthanasia that I helped, and I certainly never got a thank you card for that 2 AM GDV I did. No, that was an expectation.” It’s a certain type of person who not only can help people through something compassionately and consistently without it draining them but who can also get fulfillment through it again and again and again. So it's not all doom and gloom? MG: Not at all! I think that’s the most important thing. Every time I leave a home, I actually feel good. So many people ask if I cry, and there are times that I do—I’m not saying I don’t—but I have such good feelings from helping the family that I actually feel good about it. So I think it takes the type of person who can appreciate that. DM: A veterinarian who works with us sent us a wonderful quote. It goes like this: “I trust you understand what few can. I leave an appointment with a trail of grieving people in my wake, and I feel a glow of satisfaction and rightness and karmic return because I know that I have done good and profound work.” That, I think, says it the best.